Looming conflict 10km away is nothing new for Mhardeh where life continues and volunteer soldiers are ready to join war’s last major battle. 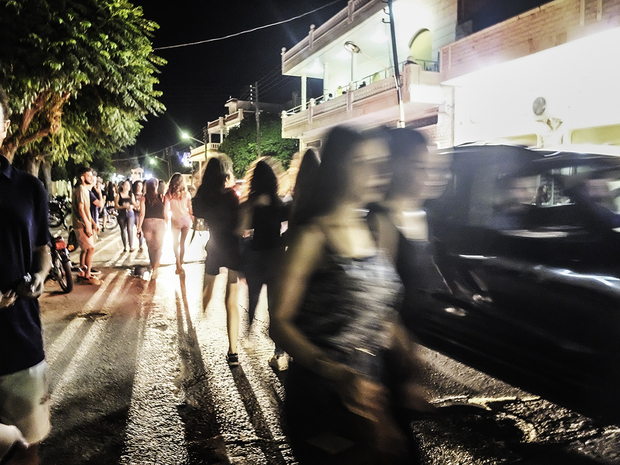 MHARDEH, Syria – Each night, the streets of the Christian town of Mhardeh teem with life. Young people in trendy attire drink beer and smoke Shisha pipes, shyly eyeing up attractive passersby and posing for group selfies, while off-duty soldiers with their girlfriends sitting side-saddle whizz through the town on motorbikes. “Look at this, even during the hardest part of the war, people are out. It’s a release, a way to forget what we are suffering because, when the mortars rain down on us, we have to hide in our basements,” says science undergraduate Samer Altouma. As people melt back to their homes and the music and chatter fades, explosions reverberate through the ground, as waiters pack away chairs and tables. 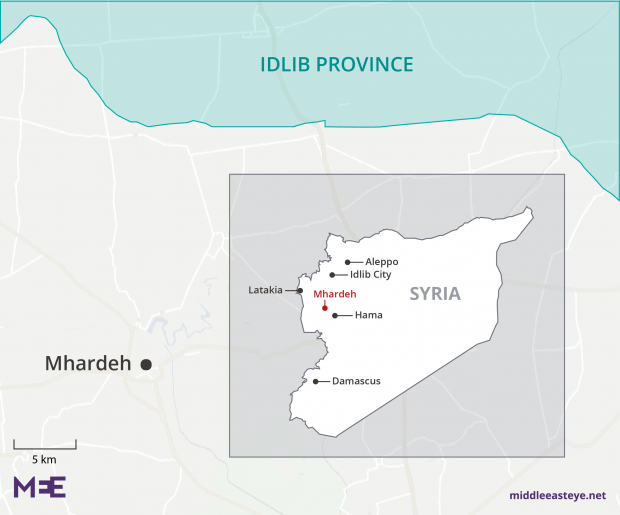 Mhardeh city centre is just ten kilometres from Idlib province, the last rebel-held stronghold in Syria, near where a snaking frontline is manned by volunteer Christian units from the Mhardeh Defence Force, the Syrian Army and allied forces. Last week, 11 civilians were killed, including six children when three missiles fell on the town. One man lost his mother, wife and three children when his house was hit. A further 20 people were injured in the attack. The looming Idlib conflict – set to be the last major battle of Syria’s ruinous civil conflict – is nothing new for the city. 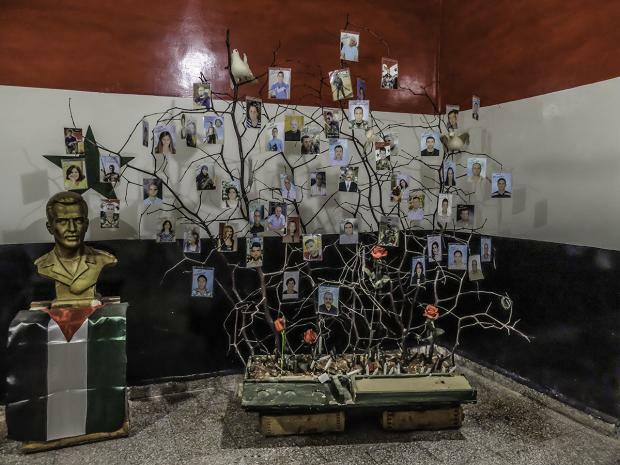 The Christian Mhardeh Defence Forces, formed in 2011 as a local branch of Syria’s voluntary pro-government National Defence Forces, have been pitted against the country’s rebel factions for seven years, after the city first came under attack. “We are peaceful Christians who didn’t want to enter the war so we tried to reach a peaceful solution and our priests went out and talked to the terrorists [armed rebels, mostly from outlying Sunni villages], trying to diffuse the situation,” says Mhardeh Defence Force commander Simon al-Wakil. At this point, seven years into the civil war, pro-government Syrians, along with the Syrian government and ally Russia, characterise all rebel groups in Idlib as terrorists. The Syrian government has presented itself as a defender of the country’s minority faiths and has extensive in-country support from Christians and Alawites. As dialogue efforts broke down, rebels besieged the city, shelling residential areas, mining roads and kidnapping passing civilians or those trying to flee, he said. With no Syrian Army units in the area, the village formed the Mhardeh Defence Force. Most men over 18 able to carry a gun volunteered and, under the leadership of Commander Wakil – the former head of a local construction company – started a defence of their city which has lasted seven years. The Mhardeh Defence Force currently has around 200 fighters on the Idlib front lines, alongside the Syrian Army and allied forces, but thousands more Mhardeh volunteers can be swiftly mobilised, according to Wakil, who says his men are on standby, waiting for government orders to advance. “Mortar, mortar, mortar,” Wakil repeats like a mantra as he drives through the city, pointing out extensive newly tarmacked sections of Mhardeh’s roads, damaged by seven years of bombardment. 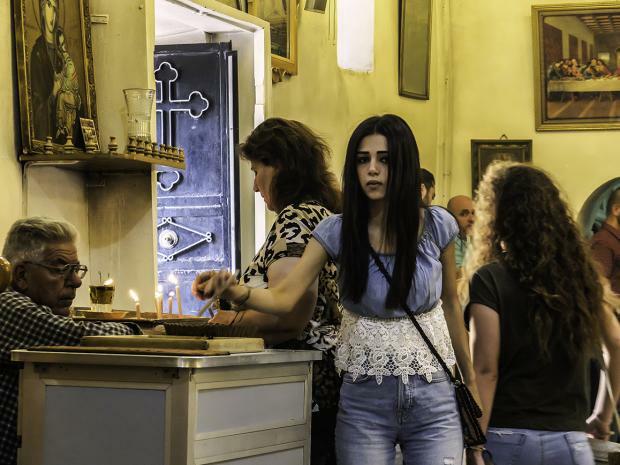 Rebel attacks have killed 97 civilians and injured a further 156 over the last seven years but most of Mhardeh’s almost exclusively Christian population have remained in Syria. This was encouraged by priests and senior members of the community who feared that, if locals fled, they might never be able to return, to an area where Christian communities have lived for nearly 2,000 years. To ensure the city remained habitable, the local council facilitated the prompt rebuilding of homes damaged or destroyed in fighting, with repairs funded by the community and wealthy locals when families did not have the money themselves. “We are such a tight-knit community that if you hit one of us, you hit us all,” explains Altouma. Although the situation inside Mhardeh has stabilised, missiles fired from rebel positions are still able to hit the city, as they did last week, and its citizens live in fear of further attacks. While morale in Mhardeh remains strong, Syria’s civil war and international sanctions have sent prices of most goods rocketing, and life remains tough. Every week, the Red Crescent in charge of distributing UN-supplied aid, is inundated by residents collecting boxes of essential foodstuffs. “These aid supplies were very, very important to local people during times of siege by terrorists, when food was used like a weapon,” explains deputy head of the local Syrian Red Crescent, Wael al-Khouri. With the city no longer under siege and the end of the Syrian conflict finally in sight, Khouri says the Red Crescent is now starting to change its focus, upping its support to local widows, the war-wounded and, particularly, the many children who have been affected by the war. The bells of Mhardeh’s four churches and one monastery ring out every day, with special ‘warning’ tolls when shelling is underway or anticipated, and on the surface life continues as normal, with bustling streets and groups of locals heading to the fertile hills to gather seasonal figs. But daily life is overshadowed by the ongoing war. In a downtown military control room, Commander Wakil monitors the front-lines, sitting in front of an array of high-power weapons clipped to the wall and a shelf of bullets carefully arranged in order of size. 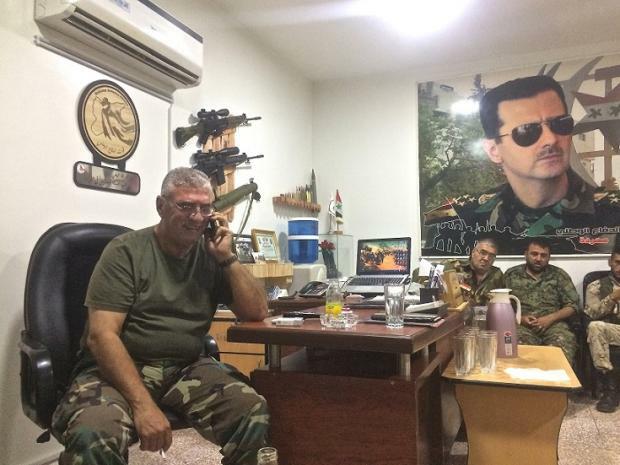 Beside a large poster of Syrian President Bashar al-Assad stretched across the length of a wall stands a glass case containing a decorated Syrian Army boot on top of the flags of the Confederate States of America and Israel. 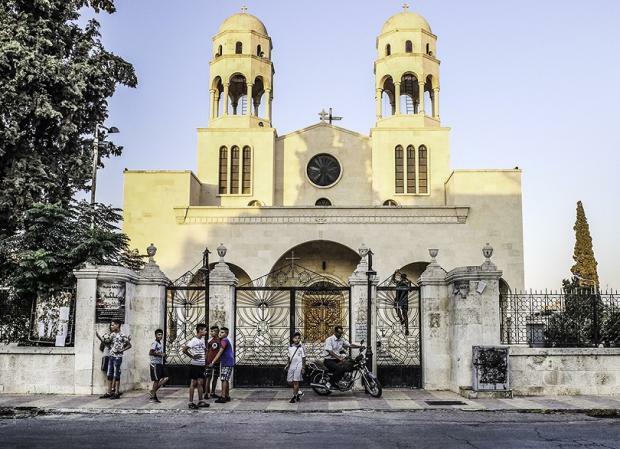 Around him, sipping strong coffee, sit members of the Mhardeh Defence Forces – teachers, doctors, engineers and poets – who, he says, took up arms to defend their Christian town, culture and history. The narrative that rebels threatened Syrian minorities has been used extensively by the government but the residents of Mhardeh say for them, this is a reality. They believe their town was targeted by rebels from outlying Sunni villages specifically for being Christian and say they were expected to flee in terror to pre-prepared refugee camps in Turkey. 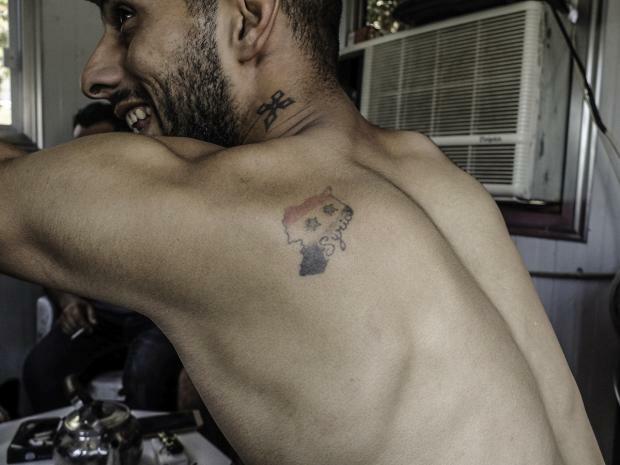 Wakil, injured himself nine times, gestures around the room, saying every man present has been injured in fighting and most have gone straight back to the front lines after treatment. The Syrian government has presented itself as a defender of the country’s minority faiths and appears to have quite extensive in-country support from Syrians of all faiths, including Christians and Alawites. On the shell-strewn front-lines, overlooking countryside and abandoned villages stretching towards Idlib province, members of the Mhardeh Defence Force manning tank and mortar positions monitor the horizon for activity. Idlib city is 70 kilometres from here, and the start of Idlib province lies just seven kilometres distant. Wakil’s military leadership of Mhardeh’s seven-year defence has made him something of a local hero. 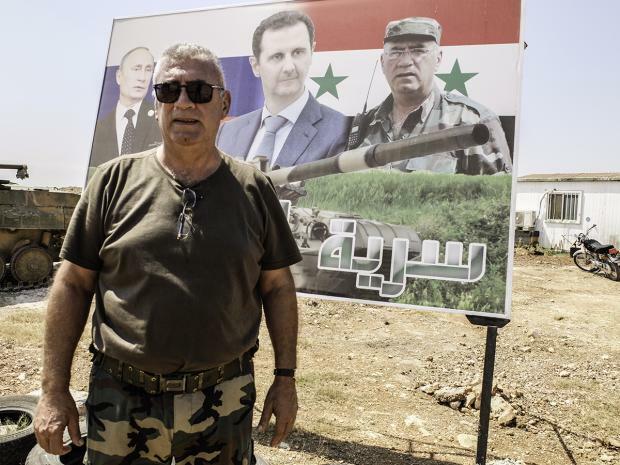 His face, alongside that of Syrian President Bashar al-Assad and Russian President Vladimir Putin, features on posters near the Idlib frontline. His portrait also hangs in an art exhibition showing the work of local art students, painted by 19 year-old Sarah Nimow who described Wakil as “inspirational”.